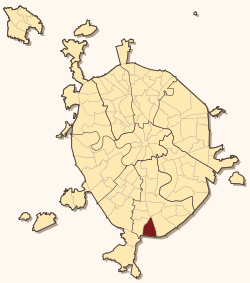 Biryulyovo Zapadnoye District (Russian: райо́н Бирюлёво За́падное) is a territorial division (a district, or raion) in Southern Administrative Okrug, one of the 125 in the federal city of Moscow, Russia. It is located in the south of the federal city. The area of the district is 8.5064 square kilometers (3.2843 sq mi). As of the 2010 Census, the total population of the district was 85,726. 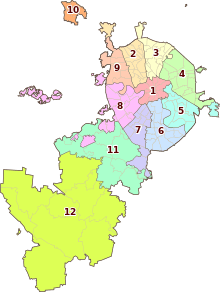 As a municipal division, the district is incorporated as Biryulyovo Zapadnoye Municipal Okrug. The eastern border of the district is formed by the railway, and two railway stations, Biryulyovo-Tovarnaya and Biryulyovo-Passazhirskaya, are located in the district. They serve the Paveletsky suburban direction of Moscow Railway.